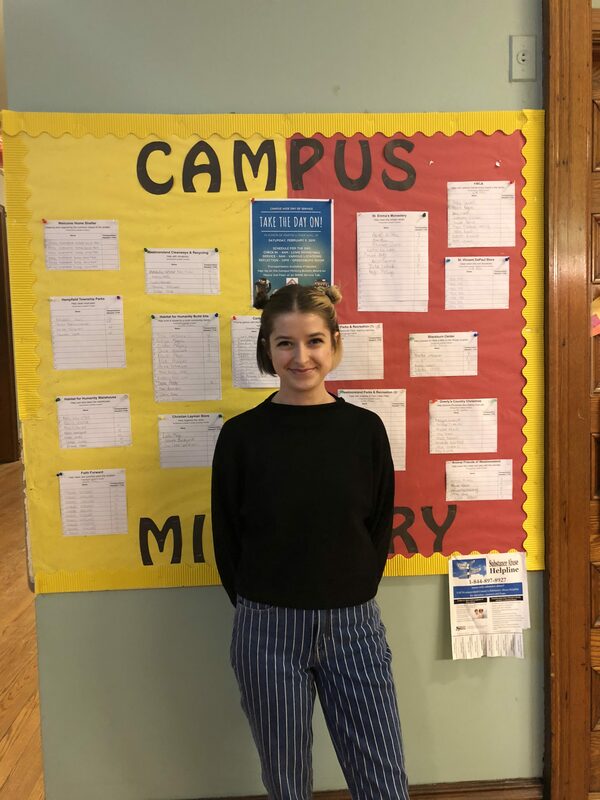 Sophomore Phoebe Walczak poses for a photo by the bulletin board on the second floor of Maura Hall, where students can sign up for Take the Day on. Photo by C.Srager/Setonian. “Martin Luther King, when he was alive, challenged everyone instead of staying inside and looking at what we could do to fix our society, to go out and do something great,” said Marissa Haynes, coordinator of service outreach. According to Haynes, Seton Hill University has used Take the Day On as a way to honor Martin Luther King Jr. since 2000. Take the Day On is scheduled for Saturday, Feb. 9. “A lot of people all around the country have this phrase ‘instead of taking a day off, like Martin Luther King Day, use that time to take a day on,’” Haynes said. There are currently 20 locations set for SHU students to visit for Take The Day On. Some locations include Blackburn Center, Westmoreland Cleanways and Recycling Center and Greensburg Hempfield Public Library. “I believe volunteering is important because it betters the community as well as yourself,” said junior Brooke Caldwell, who has signed up to help at the Blackburn Center for Take the Day On. Caldwell said volunteering is also helpful for her future career in art therapy because both involve practicing social interactions and helping others. SHU’s service opportunities are not limited to Take the Day On. SHINE now has a tab dedicated to service opportunities on campus, according to Haynes. On SHINE, students can find both weekly and monthly service opportunities. Haynes is also trying to incorporate more Service Saturday events for students who want to spend their weekends volunteering.